Tomas Abyu won the tenth anniversary edition, his third win in as many visits. Runner up Ross Houston took the Scottish Marathon Championships title. There were double celebrations for Scott McKenzie and Sarah Mearns, both from Glasgow and raising money for Multiple Sclerosis: Scott proposed to Sarah on the finish line of the event. Over 8300 runners from 45 countries entered. The mild start to the day gave way to rain but the skies were clearing as the winners crossed the finish line, leaving the Event Village bathed in sunshine for the prize giving. The Festival of Running welcomes participants of all ages and abilities to the Marathon, and River Ness 10km and 5km races as well as the Wee Nessie for pre-school children. All Festival events finished in a spectacular location in the Bught Park, beside the River Ness and close to the city centre. Supporters and spectators enjoyed live music by popular bands and delicious food from Scottish Highland producers at the Baxter's Food & Drink Fayre, as well as activities including "Super Jumpers" (reverse bungee) and WOW balls, inflatables allowing participants to walk on water (monster permitting). New course records were set in both men's and women's races, and also the women's half marathon. 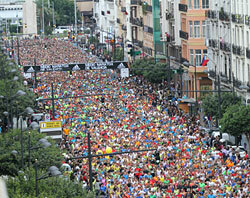 The 32nd edition took place in perfect running conditions enjoyed by the 11,417 registered entrants. Thomas Omwenga from Kenya dominated the Men's Marathon, running a negative split to break Steve Osadiuk's 2006 record, 11 minutes ahead of last year's winner Philip Samoei. 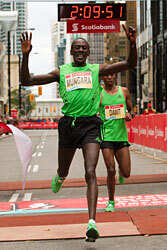 Three-time winner of the Vancouver Marathon, Omwenga ran 2:14:35 in Montreal just two weeks before. 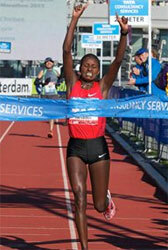 Lucy Njeri broke the 22-year old women's record set in 1989 by Val Chowaniek. She was 12 minutes ahead of Chelsea VanDeBrake, a 23-year old running only her third marathon. Njeri expects to become a Canadian citizen and hopes to compete for Canada in the 2016 Olympics. In the Women's Half Marathon Natasha Wodak improved by two minutes to break Marilyn Arsenault's 2009 course record by just 12 seconds. Arsenault came third just behind British Olympian Kathy Butler. Under clear skies and sunshine Francis Kiprop and Wei Xiaojie both made an early moved and cruised to comfortable victories writes Mirko Javaala. A group of 15 runners, led by South African Stephen Mokoko, passed through 15km in 45:47 but soon afterwards seven runners broke away: six Africans and the Mongolian record holder Ser-Od Bat-Ochir. By 20km Bat-Ocir was dropped along with one other of the group. Mokoka led through halfway in 1:04:00 and by 24km had broken clear with Benson Barus. Kiprop kept close and by 25km had rejoined them. Barus and Kiprop clocked 1:30:42 for 30km before Kiprop made his final move at 32.4km, from which point on his first career victory never looked in doubt. The 2009 winner Samuel Muturi ran a great second half to finish second in his third straight race here and his first sub-2:10 since he won with 2:08:20. The women's were led through 10km in 34:31 by Mongolian record holder Luvsanlkhundeg Otgonbayar. Yue Chao took over to lead through 15km, running her second Marathon in just seven days, after placing 7th in Chicago. Ethiopian Yeshi Esayias was in second followed by fellow countrywoman Meseret Legesse and Kenyan double World champion Catherine Ndereba. Yue went through halfway in 1:13:41, after which Legesse took up the running, but after 25km Wei Xiaojie came from nowhere to quickly leave the others behind. Immediately after the race it was unclear who Wei Xiaojie was, but she explained that she had been running under the name Wei Jie in 2008-2011 and won the Zhengzhou International Marathon this past March in a personal best 2:26:41. But this season there has been another athlete from Jiangsu Province with exactly the same name Wei Jie and so the Beijing winner decided that she will be known as Wei Xiaojie from now on to avoid confusion. She is 22 years old and a student at the Dalian Institute of Arts. Eight men were clear after just 5km writes Mirko Javala. They passed through 10km in 30:34 and 20km in 1:01:19 but the next 10km were much slower, and put paid to any really fast times. Seven runners remained at 30km, before Wilson Loyanai, Michael Kimani and Felix Keny went clear, wiht Loyanai gaining an edge by 35km, after running the fastest 5km split of the race (14:43). Kimani was just two seconds behind him, but lost ground in the next 5km to trail by more than half a minute at 40km. 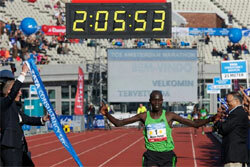 Wilson Chebet and Tiki Gelana cruised to victories at the 36th edition in ideal running conditions writes Wim van Hemert. The top six men all ran under 2:07. 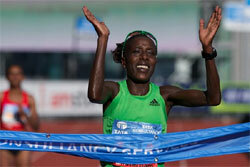 Chebet, 26, missed the course record by nine seconds: Gelana beat the mark set by Get Wami nine years ago by 11 seconds. The men went out fast, passing 10km in 29:27 and 16 of them reaching 20km in 59:22. Sileshi Sihine, the Ethiopian track star making his marathon debut, was among them — but later dropped out at 36km. Chebet was in command of the eight-strong lead group after 35km, which included putative pacemakers Eric Ndiema and Nicholas Manza, who nonetheless forged on with Chebet. Chebet broke the group in the last 5km and was never in danger after opening the gap. Ndiema tried to follow but was overtaken by Korir in final kilometre and had to settle for third. Ndiema, not yet 19, set a world junior record. Seven of the top-10 men broke their personal bests. There were four women in contention until halfway, as the Ethiopian trio Gelana, Eyerusalem Kuma and Genet Getaneh were kept company by Peninah Arusei. Behind them 37-year-old Lornah Kiplagat ran a well-judged race aimed at gaining Olympic qualification. The three Ethiopians stayed together until 30km, but soon after Gelana upped the pace to run on alone to victory, three minutes ahead Kuma,who won the race last year. Kiplagat came through to finish third, a minute and a half inside the Dutch Olympic qualifying standard. Despite the persistence of Ethiopia's Shami Dawit, who chased him right to the finish, Kenneth Mungara took his fourth title in Toronto writes Paul Gains. Canadian Reid Coolsaet twice battled back from being dropped to finish third in a new personal best. Although Jerome Drayton's 36-year-old Canadian record of 2:10:09 was untroubled Coolsaet has twice beaten the Athletics Canada 2012 Olympic qualifying standard of 2:11:29. Behind him, his training partner Eric Gillis beat the standard by one second. The women's race, as expected, came down to a duel between the two Ethiopians Koren Yal and Mare Dibaba, both of whom have Olympic aspirations. Two days before the race the 21-year-old Dibaba asked for a pacemaker to take her through half way in 69 minutes. She was told that was a little ambitious, but with Yal running alongside her Dibaba produced a half marathon split of 1:08:36 raising more than a few eyebrows belonging to marathon aficionados shivering on the side of the road. Their relentless pace continued through 30km (1:38:31) before the older and more experienced Yal put the pressure on and forged ahead. 80-year-old Canadian marathoner, Ed Whitlock, set a world best for his age class at 3:15:51, and 100-year old Faujah Singh followed him home in 8:25:16. Stanley Biwott won a close race and set a new course record. 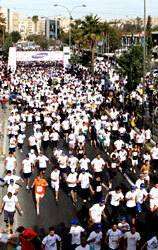 Over 19,000 runners from 29 countries took part, with another 3500 starters in the associated 10km event. 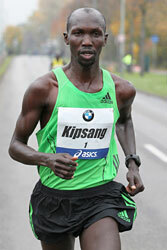 Biwott led from the start, passing through 10km in 30:16 and 20km in 1:00:23. The lead group reduced in number although the pace slowed to 1:31:03 at 30km, but then Biwott made his move. He ran the next 5km in 14:44, at the end of which he had only Asmerom for company. 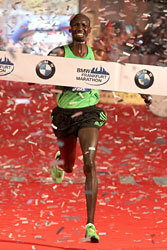 He too tailed off in the following 5km as Biwott surged on to a course record and a personal best. In the women's race Jung-Hee Oh took control from 25km to win comfortably. In the women's marathon, Meggan Franks, born in Alberta, Canada, but now living in Mississippi, USA, clocked in at 2:52:17, nearly six minutes faster than her debut at the Manitoba Marathon this past June, where she finished second. On the men's side, Brendan Kenny, also a native of Alberta, Canada, led almost from the start, at Albright-Knox Art Gallery, in Buffalo, NY, cruising across the finish line near the Canadian Horseshoe Falls. A new course record in the half marathon and a women's winner by a runner in only her second marathon highlighted this year's Niagara Falls International Marathon. With her 1:11:46 finish, Canadian Dayna Pidhoresky knocked 30 seconds off the previous best time, set in 2004 by Lyubov Denisova. It was also the best half marathon time run by a Canadian this year. Racing beside the scenic Niagara River, Pidhoresky traded the lead early on with Lucy Njeri, but then pulled away for good. In all, 6,500 runners—the most ever in the event's 14-year history—took part in the marathon, half marathon, marathon relay, 10K, 5K and schools marathon challenge, all held under mostly sunny skies and 15°C. "It was a perfect day and a great swan song," said race director Jim Ralston, who announced his retirement, although he plans to continue in an advisory capacity. 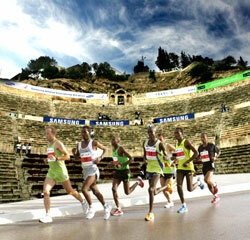 Kenyan Juliuskiplimo Maisei stormed into the 6000 seat Roman Amphitheatre to secure the honours writes Norrie Williamson. 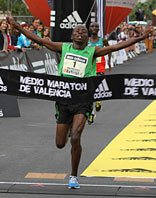 He shadowed Ugandan Fred Arapsudi for most of the four-lap course that tours the historic city centre. Jordanians dominated the early charge with Sulaiman Al-Ghordan and Methkal Abu Drais to the fore. Arapsudi then tried to up the pace amongst the seven-runner pack until Maisei pulled Ethiopians Tesfaye Girma Bekele and Birhanu Girma Bekele past the Ugandan to fill the podium places. Abu Drais topped the Jordanian awards in fifth overall. Ethiopians Sentayehu Gebremdhim and Aster Mengist Woldesemayat were inseparable for the first half until the cracks began to show as Gebremdhim pulled away to lead the women into the 166 AD amphitheatre. With Woldesemayat safe in second South African Susanna Vermaak, who had run her own race, filled the final podium place. The Amman International Marathon continues to stimulate the evolution of the running culture in Jordan and the Middle East, attracting over 8000 participants including Prince Firas Bin Ra'ad and President of the Jordanian Athletic Federation Zeidan ALAWIN to the 10 kilometre event. Fathi Suileiman diced with Hamzeh Al Mdahneh to win the downhill 10km with Al Mdahneh 40 metres adrift at the tape. The top eight broke 30 minutes. Matebo and Matebor revised their bests by over two minutes and close to four minutes respectively; and pacemaker Kirui hung in to finish sixth in 2:06:33, no mean feat in itself. There were nine Kenyans in the first ten, and altogether 14 men under 2:10, the most in any marathon. 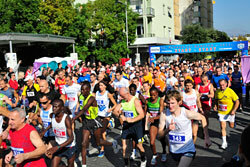 Over 3000 runners from 33 countries took part in all events. 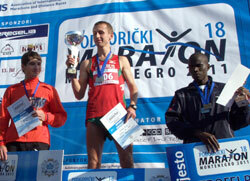 Serbia's Olivera Jevtic set a course record in the women's half marathon with 1:13:45. Sladjana Perunovic set a women's national record in the marathon with a score of 2:41:02, also within the B standard for the London 2012 Olympic Games. Serbia's Ana Subotic was also within the standard with 2:40:36. A women's national record for Macedonia was set by Tanja Veljanovska with 3:14:24. In the inaugural edition 27161 runners started the race and 26175 finished. Geoffrey Ndungu set a new course record 25 seconds faster than the previous mark set by Moses Kangogo Kibet last year. Sean Connolly staved off the challenge of last year's winner of the Irish men's race Sergiu Ciobanu to claim the National title with a time of 2:18:52. Linda Byrne took the women's title within the Olympic qualifying time. 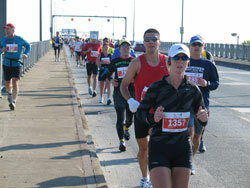 A record number of runners took part in this 32nd edition. Wheelchair athlete Paul Hannon (Armagh) won for the second consecutive time in 2:13:58.